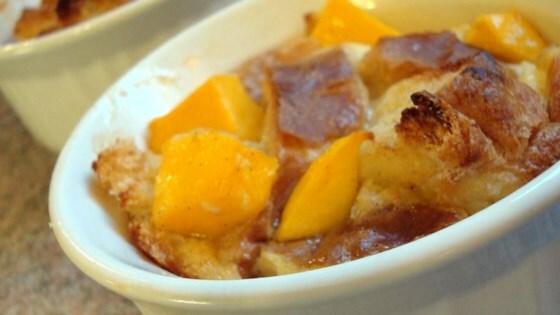 "Silky smooth bread pudding made with mangos and a healthy dash of cardamom. Passed to my mother from her girlhood friend." Preheat the oven to 350 degrees F (175 degrees C). Butter a 9x11 inch baking dish. Toss together the pieces of bread and mango, and place in the prepared baking dish. In a medium bowl, whisk together the sugar, eggs, milk, vanilla and cardamom. Pour over the bread. Dot with small pieces of butter.